I have a simple message for the government delegates preparing for the Illegal Wildlife Trade Conference in Botswana scheduled for the end of March – please don’t forget about the tigers! With perhaps as few as 3,200 wild tigers remaining, every single tiger counts. Based on known incidents of poaching, trafficking and illegal sales, at least 1,500 tigers have ended up in trade since 2000. In numbers, that might not grab the same headlines as the tragedy unfolding for Africa’s elephants and rhinos but it is no less a crisis considering just how few wild tigers remain. 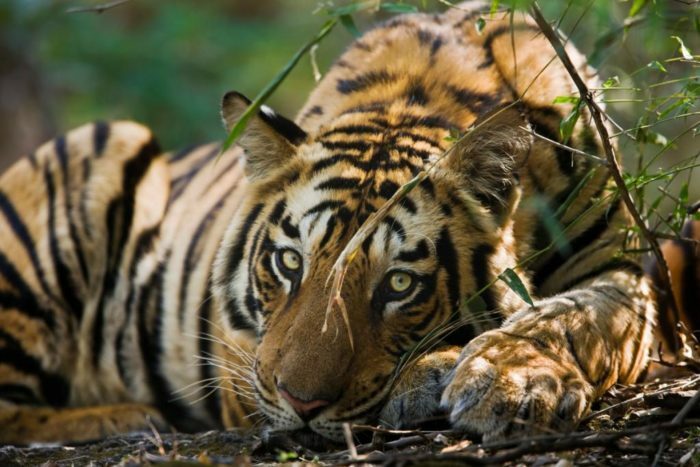 Poaching is driven by demand for tiger parts, primarily among the Chinese business, political and military elite. Tiger skin rugs are purchased for luxury home décor or bribes, tiger bone wine is considered a prestigious gift and meat served as a delicacy. Vietnamese consumers prefer their tiger bone in the form of a glue, pieces of which are mixed with wine to treat arthritis. In the closing remarks of the Towards Zero Poaching symposium in Kathmandu last week, the Secretary General of the Global Tiger Forum, Dr Rajesh Gopal, called for zero demand to support zero poaching. Quite simply, wild tigers need every government to work towards ending all trade (international and domestic) in all tiger parts (skins, bones, meat, teeth, claws) from all sources (wild and captive-bred). That is the commitment we hope government delegates to the Illegal Wildlife Trade Conference will make at the end of March. In China, the skins of captive-bred tigers are licensed for sale, issued with certificates similar to those accompanying legal ivory products. Licensed taxidermists are selling these skins to private individuals in the form of rugs and stuffed tigers, which have no scientific or educational value. A lack of scrutiny means some of these taxidermists are getting their hands on entire carcasses and illegally selling off bones and meat. For a discount, buyers can return the certificate so the taxidermist can re-use it for an illegally acquired skin. By allowing the domestic trade in the skins of captive-bred or farmed tigers, the Government of China is perpetuating the desirability of tiger skin products, stimulating a demand it can’t control. Ultimately, this demand is spurring poaching for the skins of wild tigers and other Asian big cats as a cheaper alternative. The conviction last year of a member of the Chinese People’s Political Consultative Conference (CPPCC) for trading in tiger, leopard and snow leopard skins revealed the lengths to which consumers will go to get affordable Asian big cat skin rugs. The CPPCC member was from Hangzhou on the east coast of China but doing business with wildlife criminals in Gansu Province in the far west of the country, where there are known persistent traders smuggling in the skins of wild tigers from India and Nepal. The threat posed by tiger farming and trade was recognised by the United Nations in 2007 when Parties to the UN Convention on International Trade in Endangered Species (CITES) decided that tigers should not be bred for trade – including domestic trade – in their parts and derivatives. 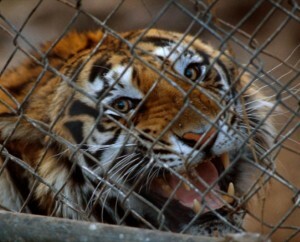 Countries with tiger farms were instructed to phase them out. At that time, China had more than 5,000 tigers in captivity; by 2010 it was 6,000 and there are no signs of a phase-out, no signs that stockpiles of the body parts of tigers that have died in captivity have been destroyed. Instead, the skins are fuelling demand and the bones are being held on private premises for some unspecified purpose. There is a total lack of official transparency over actual numbers – the numbers of tigers, of the operations allowed to keep and breed them, of certificates issued for the use of captive tiger skins, of the volume of stockpiles or of how many tigers are DNA- or stripe pattern-profiled for the purposes of law enforcement. Farmed tigers have little or no conservation value and can’t be released in to the wild. It’s not a problem confined to China; in Laos, Vietnam and Thailand, tigers are seen as commodities – agribusiness and entertainment – and there has been a mushrooming of tiger farms and so-called private zoos throughout South-East Asia, leaking tigers into illegal international trade. It’s no surprise that in the countries where wild tigers are showing signs of recovery, such as India and Nepal, there are no tiger farms. Instead, the philosophy and principles enshrined in law prioritise the protection of tigers in the wild; they are valued for the role they play in their ecosystems, the role they play in generating tourism income and for their sheer aesthetic magnificence. At the Towards Zero Poaching symposium, anti-poaching, police and customs officers, magistrates and technical experts from diverse disciplines convened to share best practice in combating poaching from the jungle to the court. Host Nepal profiled the role of Nepal Army patrols, collaboration between Department of National Parks, police and NGOs, and tourism revenue sharing with communities as key factors in anti-poaching. While the symposium was focused on anti-poaching in Asia, presenters from South Africa and Tanzania joined those from Thailand in describing best practice in improving the competency, capacity and welfare of front line personnel. Presenters from the Asian Development Bank and the Wildlife Protection Society of India (WPSI) gave accounts of the various obstacles to effective law enforcement and criminal justice responses, EIA introduced goCASE, an integrated case management system for managing criminal information, investigations and cases for prosecution, while Wildlife Conservation Society Indonesia shared some positive stories of court case outcomes. This was not a meeting of demand-reduction experts but the obvious role of demand in driving poaching was never far from participants’ minds. Lt. Col. Sanjya Deuja of the Nepal Army concluded his presentation with a picture of a tiger on a bed with the caption “How you furnish your home, affects my home”. The delegation from China presented on national anti-poaching efforts and included a diagram linking “illegal business” to the stimulation of poaching. When EIA asked if the Government had considered how legal business also stimulates demand – for example, the legal business in captive-bred tiger skins – the delegate replied his understanding was that parts of captive-bred tigers are only used for “show and presentation” and any business in tiger parts is illegal. 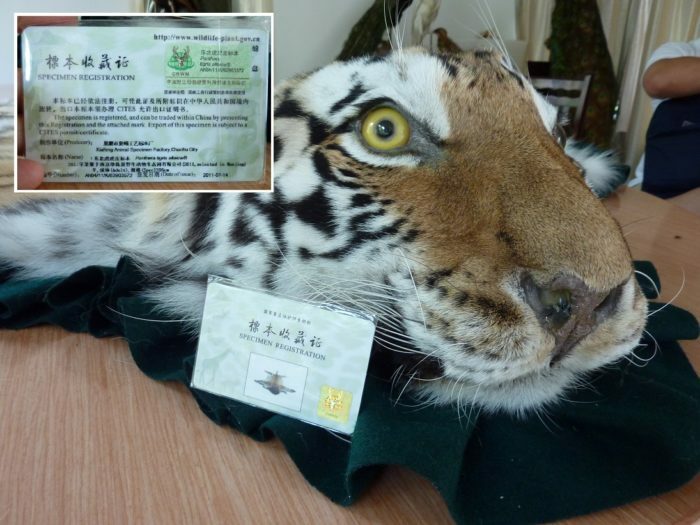 Clearly this is not the case, as evidenced by Government documents indicating that just one of the licensed taxidermists in Anhui Province has processed at least 40 tigers in the past four years and is on camera declaring to an undercover EIA investigator in 2012, that 50 per cent of his sales were to private individuals. Quite the business venture. The clearest way for the Government of China to illustrate its oft-stated commitment to ending illegal tiger trade is to once and for all declare zero tolerance on all utilisation and trade in all tiger parts and products (including from farmed tigers), to phase out the tiger farms, destroy stockpiles of tiger parts and products and to amend laws and policies so that one of the world’s most iconic animals is fully protected and not treated as luxury commodity.